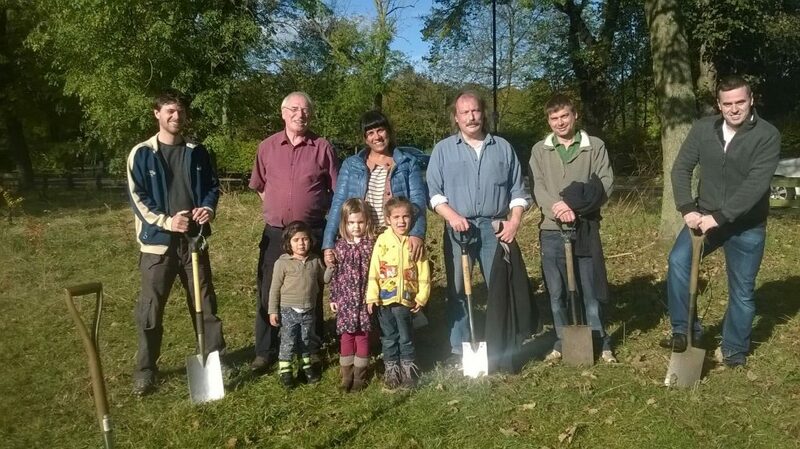 Successful completion of the LEAF funded community orchard in Nuns Moor Park and preparatory volunteer training days, followed by an enthusiastic visit by the LEAF trustees. Bringing the former bowling Pavilion in Nuns Moor Park back into community use in partnership with Sustrans and the WEA Greening Wingrove Project; equipping the Pavilion with items to make the venue usable, and hiring out the building for an expanding range of activities embracing children’s parties, a children’s club, major festivals arranged by the Angelou Centre, Wingrove Ward Committee, and the Apple Day organised through the WEA Greening Wingrove Project, as well as providing a centre for Dr. Bike sessions and Greening Wingrove Project meetings and training events. Re-seeding and maintaining the poppy meadow on the Nuns Moor Recreation Area, and supporting the further development of the wildflower meadow and garden site at Fountains Row in Spital Tongues. Progressing the planting of 1400 new trees via The Big Tree Plant scheme. Mobilising more residents in challenging the litter and waste problems in parts of our area, together with engaging the City Council in a conversation about how we might all work more effectively together to make Wingrove cleaner. Sourcing and following up free legal advice on how environmental protection legislation might be used more effectively in Wingrove. Working with the Nunsmoor Centre Trust to publicise the hugely attended Winter Festival at the Centre in December 2016. Completed the Nuns Moor Recreation Area poppy meadow by installing a heritage panel explaining the historical significance of the site. And hosting BBC Radio 4’s famous Gardeners’ Question Time programme in March 2015 that both publicised Greening Wingrove to a wider audience, as well as providing many useful tips (and, yes, the programme panel’s suggestion of planting nasturtiums in street planters proved to be a good one!). Consulting the wider community and Park users on the future of Nuns Moor Park. Developing business plans for the Park buildings including the Depot and the Pavilion. Drafting a prospectus for the future of Nuns Moor Park, developed in collaboration with the wider community and Park users as the basis for actively influencing City Council’s thinking about the future management of parks when the money to maintain them runs out. Extending regular litter picks beyond Arthur’s Hill, and putting in place a friendly guide for new residents explaining how local refuse systems operate. Understanding through research the interests of the CIC’s membership and how to make membership more meaningful as a valuable asset for the CIC as a community enterprise. Varied attempts to engage landlords and property management agents in understanding the value of cleaner, greener and more stable neighbourhoods have been made but, with notable individual exceptions, there seems little interest from that sector so far. And, in partnership with the WEA Greening Wingrove Project, we are preparing major funding bids to turn the CIC into a viable, co-operative community enterprise that can raise income to achieve its aims.